diabetic snacks. diabetic vegetarian snacks. When we think of snacks and in relation to diabetics, then they have to be healthy. For diabetics and healthy living, it's important to have small regular meals all through the day. By eating a big breakfast, lunch and dinner is not the healthy way to go. Break your meals into 2 to 3 hours and have some healthy snacks. Diabetics need to snack often as they don't as by having a large gap between meals will cause a drop in blood sugar level. So eat small frequent snacks between your breakfast, lunch and dinner. 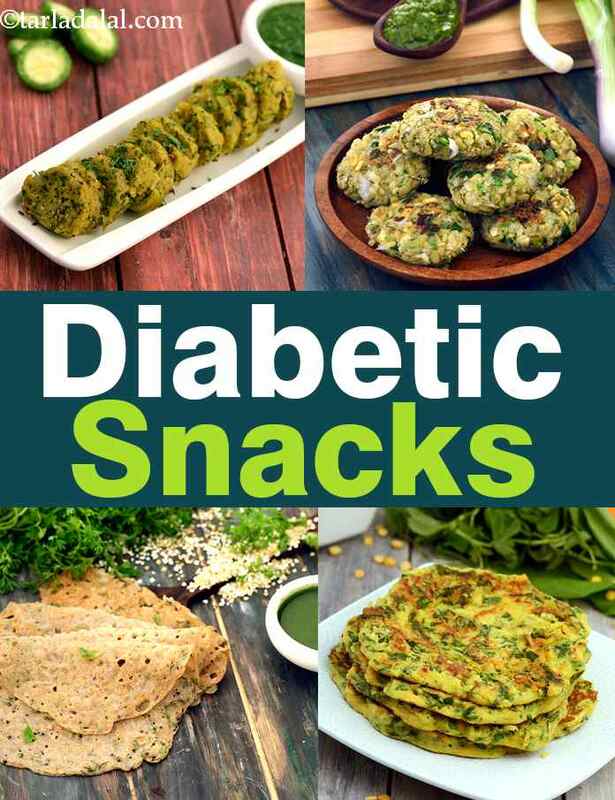 South Indian snacks, while being fairly nutritious are often not suitable for diabetics. Instead of Idli we have green moong dal and vegetable idli recipe where rice is replaced by wholesome moong dal and vegetables. Adai is a crisp golden dosa made of rice and mixed dal. We have modified this popular South Indian breakfast recipe to use broken wheat with dals to make a healthy diabetic adai recipe. Oats contain Magnesium that helps in improving insulin response and they are rich in fibre. So using oats in your snacks is good. Oats and moong dal tikki is a fibre and protein rich snack for diabetics. Remove rice which is high in simple carbohydrates and use oats in healthy oats dosa recipe. 3 great ingredients for diabetics : ragi + oats + whole wheat flour combine to make ragi and oats cracker with cucumber dip. The dip is made from low fat curds and cucumber. Karela is the number one go to ingredient for diabetics and we all struggle to eat it due to the strong bitter flavour. So try our karela tikki recipe which is made with low fat paneer, carrot and green peas. Have this with diabetic friendly garlic tomato chutney. Karela, garlic and onions form the base for these steamed karela muthai recipe. Sprouts are low in calories, high in fibre and good for diabetics. We have created moong sprouts and spring onion tikkis which are bound together with oats. Take a whole wheat roti and stuff it with methi and moong sprouts to make a healthy methi and moong sprouts wrap recipe. Enjoy our Diabetic Snacks and other diabetic articles below. Tarla Dalal Hi Pushpa, . Hi, Thank you for your kind words. Do try more and more recipes and let us know how you enjoyed them. And also 1 cup measures approx 200gms. Happy Cooking!